For our photography walk project, I chose to follow the brief to create a series of portraits, where the subjects themselves chose how they'd like to be photographed. 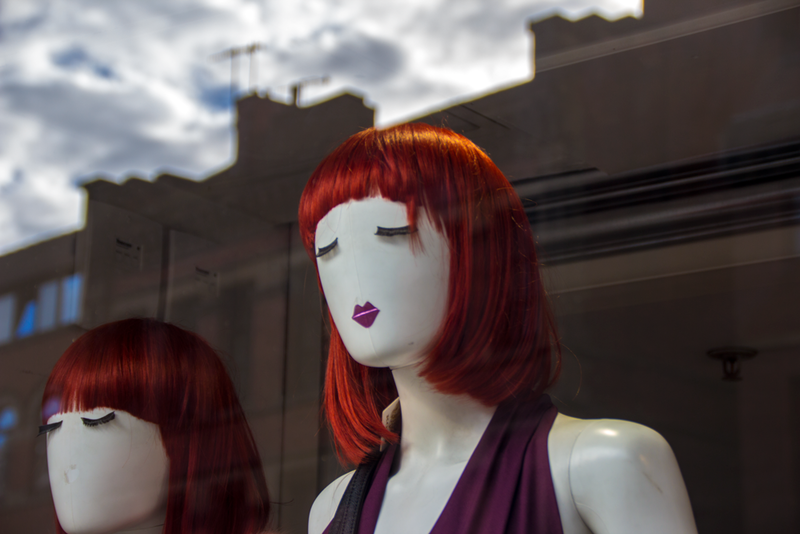 To take a slightly different spin on this, I chose to take my portraits of various shop mannequins - pre-posed and dressed by the owners of that shop to portray an outward image to the public of the ideals their brand promotes. 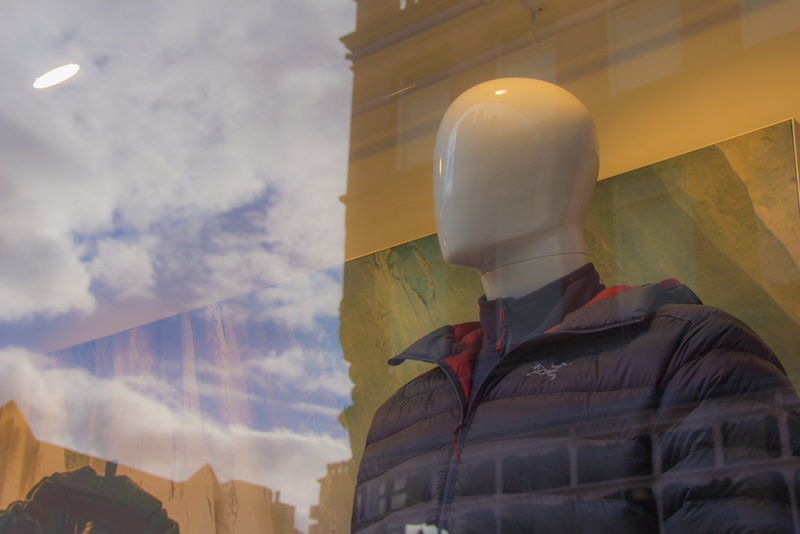 Unable to eliminate the glare from the shop windows I was photographing through, I chose instead to use this as part of the image. Reflecting an echo of the environment the subject has been pre-positioned within. Often I found that the mirrored view in the glass worked with the figure surprisingly well. In this image the reflection comprises of open sky, sandy yellow and earth green. This, for me, made a clear link with the open, outdoor spaces the brand's clothing is designed for. 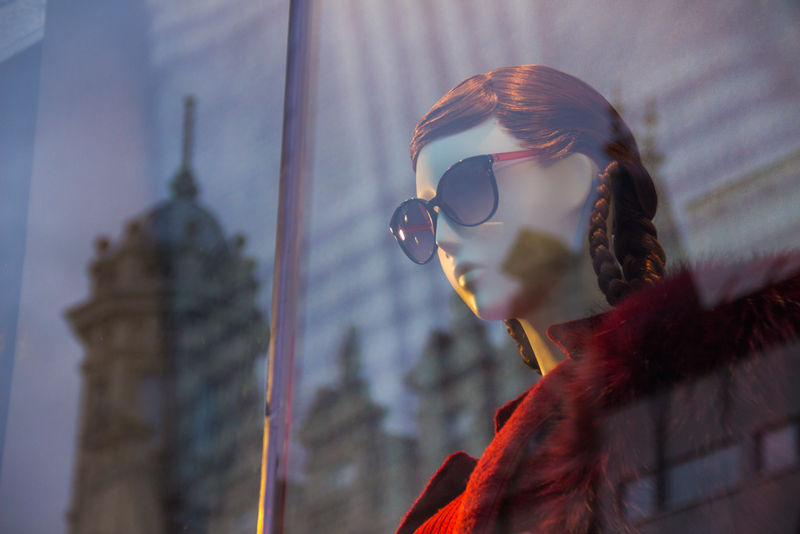 I was also intrigued by some of the choices that had been made for the mannequins, a great example being in the bizarre juxtaposition of the summer sunglasses and winter furs in this photograph, something we would not necessarily automatically question in passing. 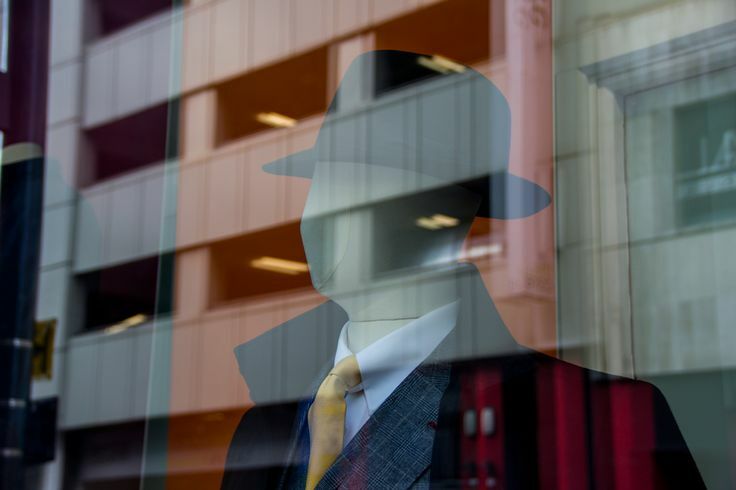 Due to the nature of the brief I'd chosen, and the nature of shop windows, the oddities remain as a feature of the final images. 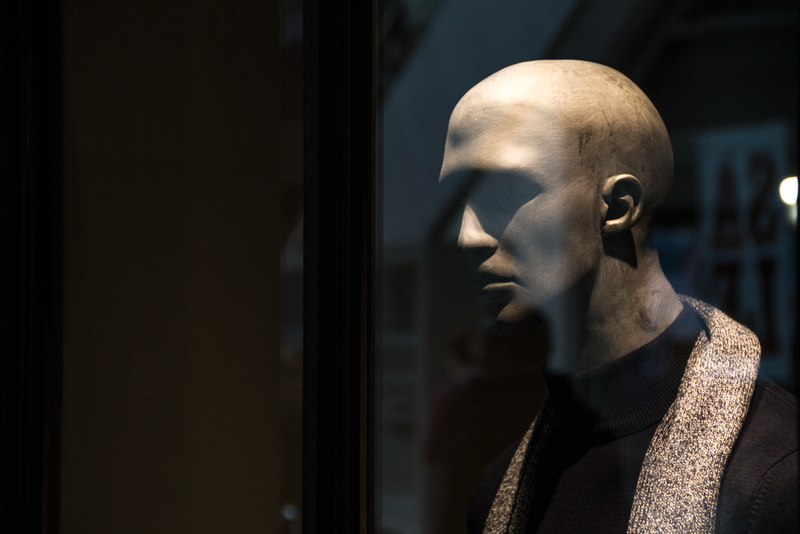 A male figure in a River Island display. Another thing I noticed was how all figures looked down on you. I was unable to frame them in any other way but looking up, at their supposed, faceless superiority. This was perhaps my most intriguing find. The mannequins on show outside Jack & Jones in the Leeds Trinity Centre did not conform to many of the rest. They were at face-height, solemn looking (instead of entirely faceless), and far more highly detailed than the others I saw. 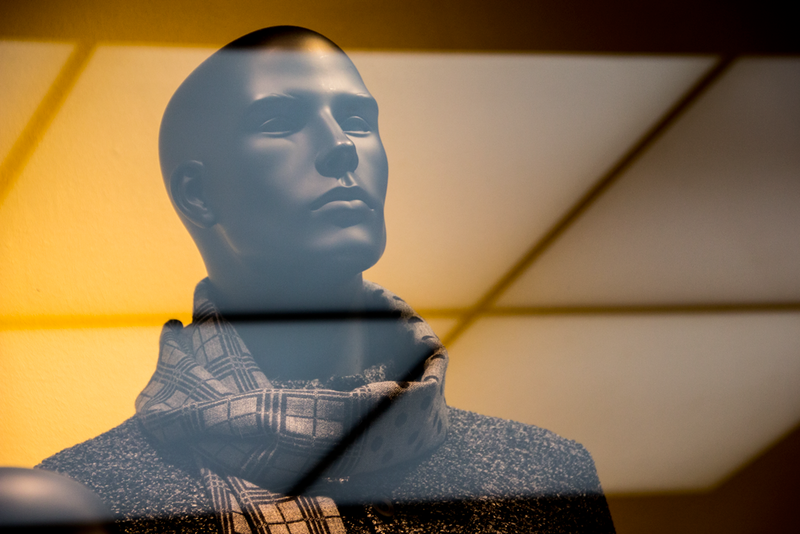 This particular image reflects the lighting the shop had also chosen for the display, moody and noirish. This is the only anti-heroic figure I encountered. This figure was just the accessories: wig, false lashes, lipstick, dress. Everything that could be naturally applied to a model in a constructed shoot, but instead hung in place on a lifeless and faceless mannequin. The image really highlights to me the power of the mannequin as a stand-in. In an odd way my brief here may have failed, as although the mannequins are constructed for us to view in a very specific way, we are actually intended to consider ourselves as the subject. In many ways this is not the objective project brief of documenting other people's perceptions of 'self', but rather a subjective documentation of one's own self ideals externally represented.